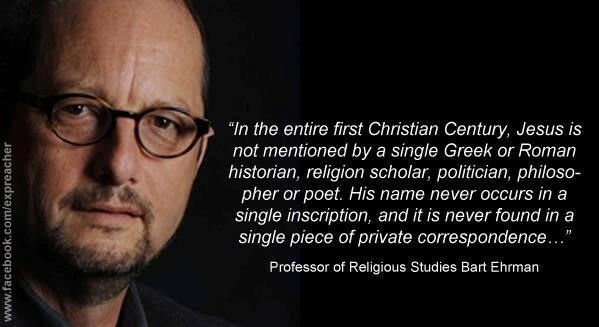 Bruce Gerencser reproduces a recent post from Bart Ehrman’s blog, Why I Am Not a Christian. My personal view is just the opposite. My view is that there *is* no realm above or outside of this one that provides meaning to life in our world. In my view this world is all there is. I reproduce the image above from Gerencser’s posting because it makes a point that the average man or woman out in the pews doesn’t know — and the average pastor never admits. There is a legitimate, serious question about who the man Jesus was. There is no — NO — contemporaneous historical evidence that he ever even existed; whomever he was, he certainly was not the 1st-century hippie-celebrity of Sunday school.